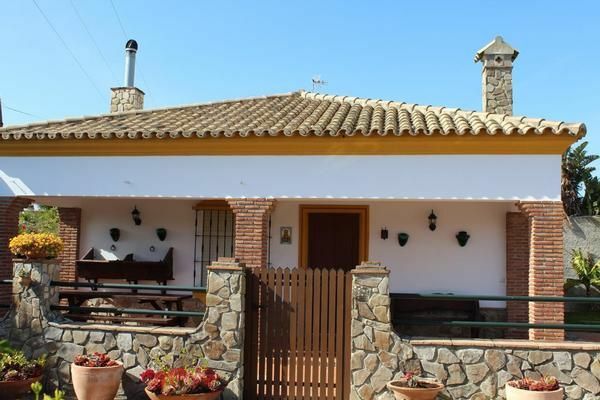 This comfortable house, built in 2000, is situated 100 m from the centre of Canos de Meca and only 800 m from the sea. The interior of this 3-room house of 70 m2 has got simple and comfortable furnishings. The living/dining room is equipped with 1 sofa, open fireplace and satellite-TV. One of the two bedrooms has a double bed (135 cm) and in the other room you find two beds (90 cm). The open kitchen with bar is completetly equipped and has 4 hotplates, micro wave, freezer, washing machine among other things. The bathroom has a bathtub, bidet and WC. The house offers wood heating. We have bycicles at your disposal as well as a tennis court and a ping-pong table. Bird watchers take advantage of our experience to see the best of the Autumn migration. Imagine sitting in your own private terrace, with a refreshing drink, with the aroma of freshly picked vegetables on your barbecue as you watch the sun setting over the Atlantic Ocean. Casa Guemon is situated on the Costa de la Luz,halfway between Tarifa and Cadiz. The house is just fifteen minutes from the white Moorish village of Vejer de la frontera and ten minutes from the beautiful beach at Conil. Positioned at 800 meters from the beach, the finca has spectacular all round panoramic views and being three hundred metres from the centre of the nearest village, Zahora, the house is an idyllic venue for either a wonderful beach holiday, a quiet relaxing holiday, or both. Casa Guemon is a purpose built cottage that has been designed to provide both space and comfort for four people. The private patio, with a shaded area, looks to the east; offer complete relaxation while watching the natural Park of La Breña. The two bedrooms and lounge windows face southwest and provide our guests with views to the garden. Considerable effort has been made to ensure that adequate furnishings have been added to satisfy both short and long stay requirements. Once you arrive, as our guest it is our desire to give you, a holiday you will wish to repeat, providing high quality, spacious, clean accomodation, surrounded by well-maintained gardens. I ensure that your visit will be remember with an abundance of pleasant memories. Terrace furniture, barbecue, deck chairs. View of the mountains. Facilities: washing machine. Please note: maximum 2 dogs accepted. For shared use: grounds 2000 m2 and table tennis. Private: garden with lawn. Pergola, garden furniture, barbecue. In the house: bicycles available. Parking in the grounds. The house is simple but comfortable and at only 8 km from the centre of Barbate, 8 km from the centre of Conil de la Frontera, in a quiet, sunny position, 800 m from the sea. Shops, supermarket and restaurant in 100 m in Canos de Meca. Canos de Meca is a small but unspoiled community on the windswept but stunning Costa de la Luz on the Atlantic coast. Deep in the Parque Natural del Acantilado, Canos de Meca has beautiful beaches, backed by cliffs and pine trees. The singer/actress Lola Flores was originally from this area, and much to the pride of the locals, often spent her holidays in here. - Pet: once per object Costs amounting to 15 EUR (Mandatory). - Intermediate cleaning: per object and day Costs amounting to 50 EUR (optional). Intermediate cleaning (per property and day, included in price 30 EUR).